Washi tape is one of those particular products we seem to hoard because we can't bare to part with it. However, you will be amazed at just how little you need to use from your stash to add a touch of fun to your projects. Today I'm going to show you how to apply a little bit of dimension using a very small amount of washi leaving plenty of leftovers in your collection for future projects... or just to look at and admire. I simply used multiple strips of washi tape in layers and gently curled at the ends to create a feathered look to the wing of the flamingo. It produced a soft effect that gave the layout a lift without going overboard on using too much of my tape. First step was to place small lengths of tape to plain vellum before cutting each individual strip and then punching one end with a rounded corner punch. Next step was to overlap and adhere each strip to the wing of the flamingo before gently bending each tip around a pen to create the dimension. 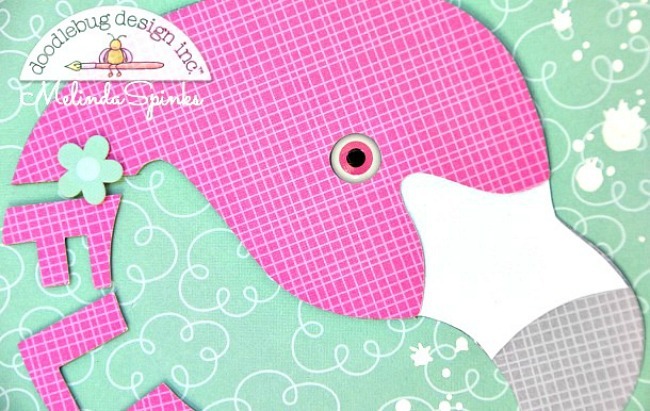 This gorgeous flamingo is from the Doodlebug - Fun In the Sun cut file collection which you can find at the links below. However I did alter the file a little as I wanted to put the title of my layout 'Flamingo' down the shape of the neck. And just look at that pink eye, it almost looks real - well it's actually from the Shaped Sprinkles (eye candy) in this year's Booville collection. I kid you not! I didn't hold back in mixing and matching collections on this layout with a combination of Spring Things, Booville, Fun In the Sun, Milk & Cookies plus a touch of Petite Prints card stock. I will always find room on my layouts for anything transparent like these sweet clouds and sun from the Spring Things Odds & Ends pack. WOW!! Love this! That flamingo is awesome! Can you do a tutorial one day on how you made the word flamingo curve. I've never seen that technique before on my Silhouette. Beautiful. 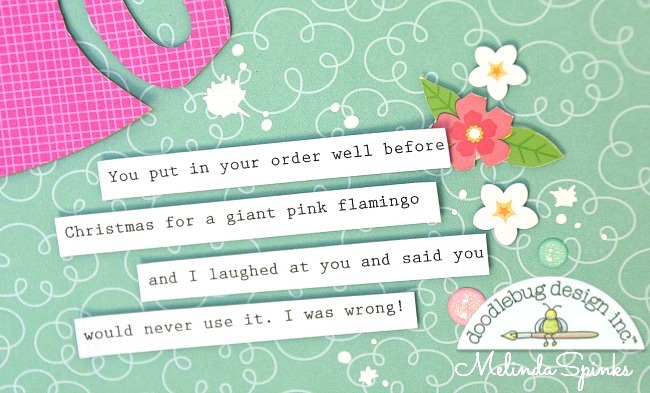 Your flamingo is adorable. I love all the cute things you ladis are creating with washi tape!! What a fun idea! The ruffles and clever way you did the title are amazing! Oh my goodness !! This layout is just stunning !! I'm completely blown ! Amazing layout, Melinda! Love how you used the washi tape and your title is ingenious!! !